Hugo Chavez, Venezuela's fiery and controversial socialist president who came to power on wave of popular sentiment and befriended some of the world's most notorious dictators, has died at the age of 58, Venezuelan Vice President Nicolas Maduro said today. 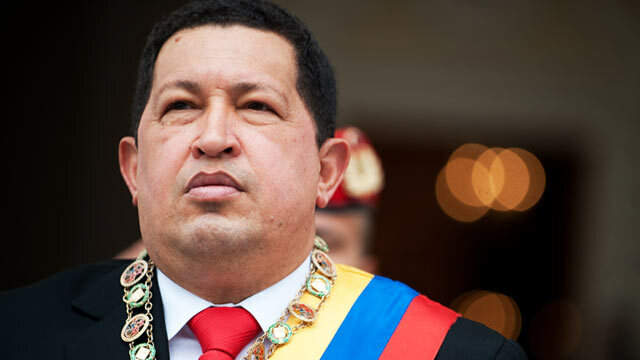 Chavez had been fighting cancer, recently seeking treatment at a clinic in Cuba. A self-described champion of the poor who first tried to overturn Venezuela's powerful elites in a failed 1992 coup, Chavez was democratically elected in 1999, with huge support from the country's poor. During his time in office, he became one of Latin America's most well-known and polarizing figures. A constant thorn in the side of the United States, he commanded headlines in newspapers around the world. A populist who suppressed free speech, he remained immensely popular among his country's poor. From the time he won election in 1999, Chavez held onto power through tightly controlling the media and through a series of populist elections and referenda, including one that allowed him to seek a limitless number of terms. Chavez, whose public appearances diminished in recent months, received his first surgery and chemotherapy treatment for cancer in Cuba in 2011. He returned to Cuba, a guest of that country's ailing socialist leader Fidel Castro, for treatment and surgery in February 2012. Chavez announced on Dec. 8 on state television that he would travel back to Cuba to undergo surgery since his pelvic cancer had "returned." Despite his ailing health, Chavez was reelected last year. Chavez was born in 1954 in the town of Sabenta, Venezuela. Both his parents were schoolteachers. A military academy graduate and a decorated paratrooper, in the 1980s he and a group of officers founded an underground socialist organization named for the 19th century South American revolutionary Simon Bolivar. In 1992 that group, the Revolutionary Bolivarian Movement, led a failed coup that ended with 18 people killed and Chavez imprisoned. Chavez spent two years in prison before receiving a pardon. After leaving prison, he rebranded his movement into a populist party called the Movement of the Fifth Republic and replaced his military uniform with business attire, or oftentimes a red shirt or red track suit. Venezuela has one of the longest democratic traditions in Latin America, but by the early 1990s many of the country's working and middle class people were disenchanted with the country's two primary political parties, both of which suffered from endemic corruption. Chavez, an icon from his prison days, promised to rid the country of corruption and pledged to divert revenue from the country's ample oil sales to projects aimed at helping the poor, including improved education and health care. Unemployment and poverty, however, remain high despite the country's oil wealth. Always the firebrand, Chavez created a series of bogeymen on which the Venezuelan people could pin their frustrations, firing jabs at traditional spheres of power and influence, including the oil companies, the Catholic Church and the United States. In a public address he once said of oil executives that they live in "luxury chalets where they perform orgies, drinking whisky." He accused the church hierarchy of ignoring the plight of the poor, claiming Jesus would have been a socialist and priests "do not walk in ... the path of Christ." His greatest ire, however, was saved for the United States, particularly former President George W. Bush. He called Bush a "liar," "coward," "murderer" and "donkey." In a 2006 speech before the UN General Assembly, he called the U.S. president "the devil." "I think I'm just saying what many people would like to tell him. I said he was a donkey because, I think, he's very ignorant about what is actually happening in Latin America and the world," Chavez told ABC's Barbara Walters in a 2007 interview. He further needled the United States by closely allying himself with some of America's enemies, including Castro and Iranian President Mahmoud Ahmadinejad. Despite promises that he would clean the country of corruption, his administration was rife with corruption. He and his government were routinely criticized for human rights abuses, particularly restricting freedom of the press.